As you gain more experience as your loved one’s caregiver, you’ll become an expert on when he or she needs help but doesn’t know how to ask for it. A frequent example of this is the need for assistive aids. These are worth researching, as they can greatly improve the quality of life for the person you so lovingly care for. So, just what are assistive aids? These are devices (electric wheelchairs, canes and hearing aids) designed to maximize your loved one’s mobility, safety and independence. And what are the signs that it’s time for assistive aids? Things like: Listening to the TV at loud volumes that hurt your ears; Gripping furniture just to walk across a room; Having trouble chewing their food. Are you thinking, “Ugh, it’s going to be so awkward and awful to bring this up?” Well, we have a strategy for you. 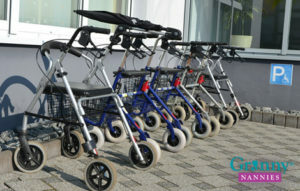 See what kind of assistive aids your senior’s buddies are using. This may help you transition to discussing them without a taboo, as they will seem more natural if you point out that other people are having a better time using them in their own lives. Next up, where to get assistive aids? Sure, there are infomercials, things on amazon.com or even in the local CVS. Before you go shopping, research what your senior’s insurance covers. For certain assistive aids, like a hearing aid, your best bet is having the primary care physician refer your loved one to an audiologist. Other things like a cane or a walker may be an over-the-counter option. ← Spring cleaning your loved one’s prescription medications, old equipment and more!